Following an outbreak of shingles, there is a risk of developing a chronic pain condition known as post-herpetic neuralgia. 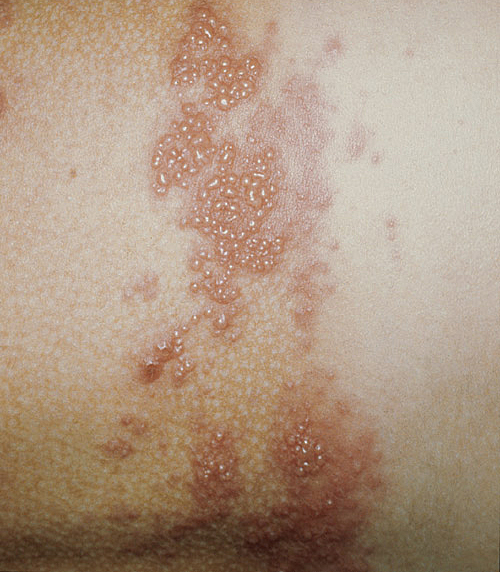 The risk is greater for those who are over 50, or who have a severe shingles outbreak. If the original outbreak occurs on the face, the risk of post herpetic neuralgia is also greater. Post herpetic neuralgia occurs if the pain of the original shingles outbreak lingers after the rash and blisters have disappeared. It is commonly described as a burning or tingling sensation; it often interferes with normal daily body functions, such as sleep or appetite. If you notice any of the following after the initial lesions have cleared, post herpetic neuralgia is a distinct possibility. A follow up visit with your physician is in order! If an individual is diagnosed with post herpetic neuralgia, the usual course of treatments are medications. Certain antidepressant and anti-convulsant medications can be used, along with topical lidocaine or capsaicin. The best approach to this uncomfortable condition involves prevention. If you notice a shingles outbreak on your body make every effort to see a doctor and initiate antiviral therapy within 3 days. The other preventive measure that is available at this time for persons age 60 and over is to consider immunization via shingles vaccine. This is a personal decision; read about it and talk to your health care team about any questions or concerns you may have. You can view/print information about this vaccine on the CDC web site by clicking here.